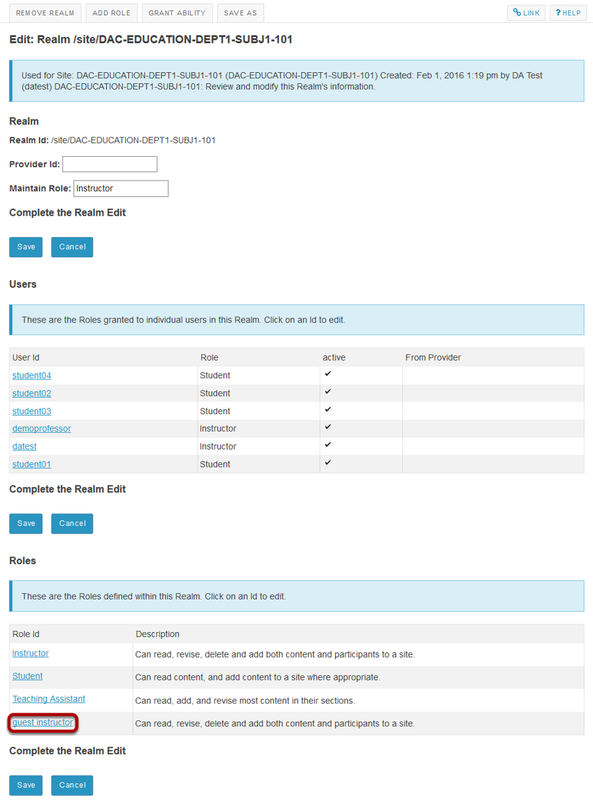 Sakai Community DocumentationSakai 11 - EnglishSakai 11 Administrator Guide RealmsHow do I create a new, or custom role within a Realm? 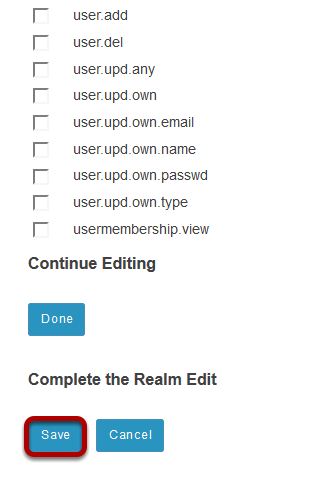 When adding a new role to a realm, it is often easiest to copy an existing role that is similar to the one you want to create, and then add or remove the permissions as required. 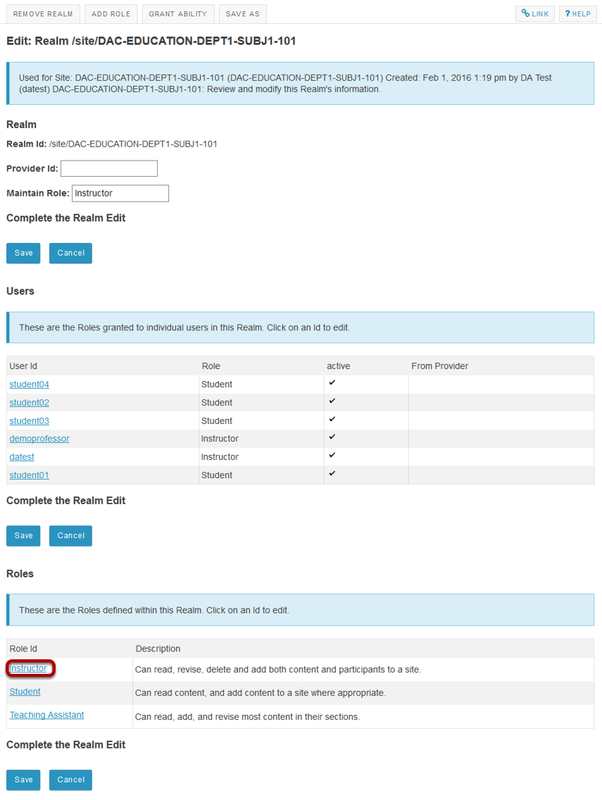 Select the Realms tool from the Tool Menu of the Administration Workspace. Search and locate the site you want to edit. Zoom: Search and locate the site you want to edit. Tip: You can locate the site id of a course or project site by using the admin Sites tool to search for the site and view/edit its details, or by accessing the site and copying the site id from the URL displayed in your web browser. 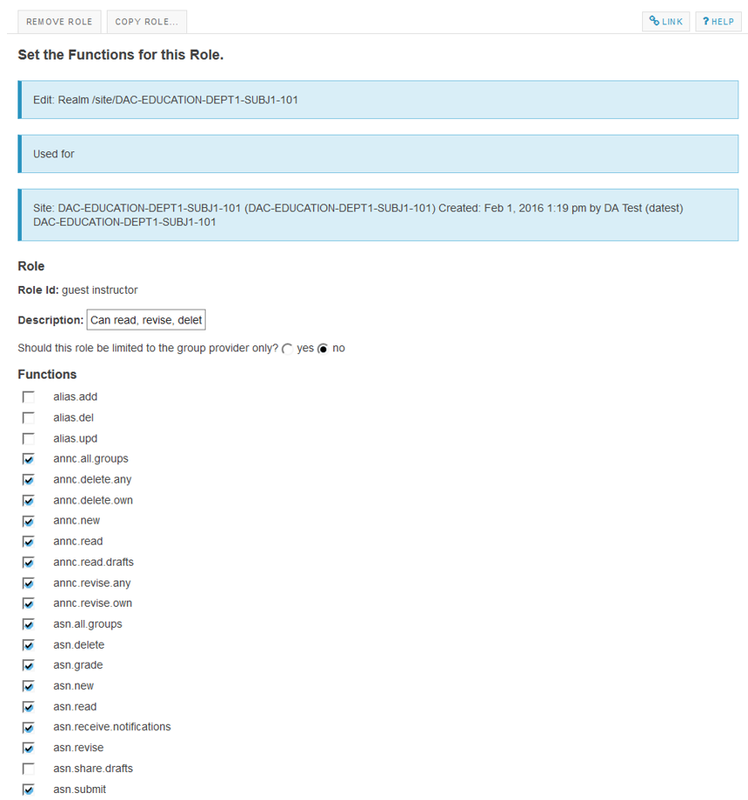 The site id is the string of characters displayed just after the /site/ portion of the URL. Click on the realm id. Zoom: Click on the realm id. Click on the role id for the role you want to modify. Zoom: Click on the role id for the role you want to modify. Enter a role id for the new role and Save. Click on the role id for the new role. Zoom: Click on the role id for the new role. Zoom: Select the desired permissions. You will see a long list of permissions. This list represents all of the different permissions available to users in the system. Check the box next to the permissions you want that role to have, and deselect any permissions that you wish to remove from that role. After you have made all of your permission selections, scroll down to the bottom of the page and click Save. Tip: If you need to edit additional roles within this realm, select the Done button instead to return to the realm detail page and edit other roles before saving your changes to the realm. Prev: How do I modify an existing role within a Realm? Next: What Resources are specific to admin users?